When the comet is close enough to the sun the ice on its surface ‘sublimes’ — transforms from solid to gas — forming a gas atmosphere called a coma. Analysis of the coma by instruments on Rosetta revealed that it contained not only water, carbon monoxide and carbon dioxide, as anticipated, but also molecular oxygen. But where did the oxygen come from? London/UK — The Rosetta science team originally reported that the oxygen was most likely from the comet’s main body, or nucleus. This meant it was ‘primordial’ — that it was already present when the comet itself formed at the beginning of the Solar System 4.6 billion years ago. One group of outside researchers however suggested there might be a different source for molecular oxygen at comets. They had discovered a new way to produce molecular oxygen in space triggered by energetic ions — electrically charged molecules. They proposed that reactions with energetic ions on the surface of comet 67P could instead be the source of the detected molecular oxygen. Lead author Kevin Heritier, from the Department of Physics at Imperial, said that the first detection of molecular oxygen in 67P’s coma was both very surprising and exciting. The scientist tested the new theory of surface molecular oxygen production using observations of energetic ions, particles that trigger the surface processes which could lead to the production of molecular oxygen. They found that the amount of energetic ions present could not produce enough molecular oxygen to account for the amount of molecular oxygen observed in the coma. 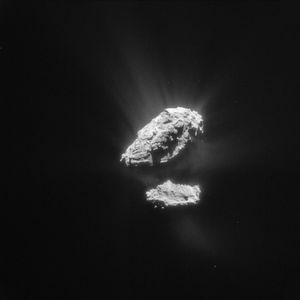 Co-author Dr Marina Galand, from the Department of Physics at Imperial and Science Co-Investigator of the Rosetta Plasma Consortium, added that surface generation of molecular oxygen may still happen on 67P, but the majority of the molecular oxygen in the coma is not produced through such a process.